Paul Tisdale was delighted with his side after they cruised to a 2-0 win over Carlisle United on Saturday to stay top of League 2. 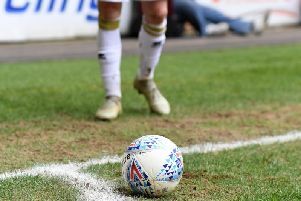 While Lincoln edged past Stevenage 1-0 at the Lamex Stadium, Dons were in total control against the Cumbrians throughout, though the visitors could have taken the lead against the run of play but hit the woodwork. But second half strikes from Jordan Houghton and Kieran Agard gave them the three points - their sixth consecutive home win in the division. "I really enjoyed it, love the win," Tisdale said. "I like a 2-0 – it shows a control and competency. To give some context, Carlisle have a better away record than we do at this stage of the season, but we were on it. I really enjoyed the way we played. "I'd like to give the players credit for being alive, crisp and bright and trusting each other. I hope it's not a one-off and we continue to play in this fashion. Even with a couple of changes. I thought Lawson D'Ath was excellent and Jordan Houghton changing position too - he's a good footballer, and it was a football match that suited him – not every game will suit him like that, but today was about beating Carlisle and we did that. I'm delighted." Houghton, playing at centre back, scored his second of the season just five minutes into the second half, driving low into the bottom corner, surprising keeper Adam Collin who saw it late. Tisdale added: "We talk all the time about keeping it low. A clean strike a yard over the bar will never go in – maybe if it hits a beachball like at Sunderland! It was on target and low in the corner is no better place to put it." D'Ath was a lively addition to the side, with both Jordan Moore-Taylor and Chuks Aneke out through injury. The former Luton midfielder hobbled out late in the day, but put in, what Tisdale described as his best performance in a Dons shirt. The manager added: "He played really well. It's the first match he's had in a game that suited him. I have a lot of faith in him, I know what he's about. I had him at Exeter years ago, he has had a slow start with injuries but it was lovely to see him play so well. There's a real quality about him."